The original Brief from the client was to renovate and extend the existing property. However, there were many elements that the client didn’t like about the original dormer bungalow, and there were structural and drainage issues. After an initial analysis ICE Architects recommended that the client should go for demolition and a new build instead. The client benefits from new build in two ways. There is no compromise on design and layout. The client wanted a mainly traditional home but with some contemporary twists. It was decided that the build process would be a ‘self build’ as the client wanted direct control over costs, timescale and build decisions. To help with day-to-day supervision of on-site work and ordering and taking delivery of materials, the client employed site managers. 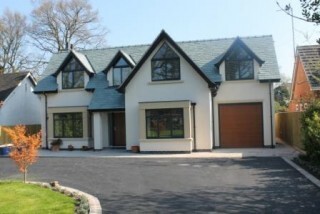 The new property incorporates a high standard of products with K-Rend walls and a beautiful natural slate roof. Internally it has been finished to a high specification. Coupled with the contractors’ attention to detail the outcome is a beautiful and comfortable home.